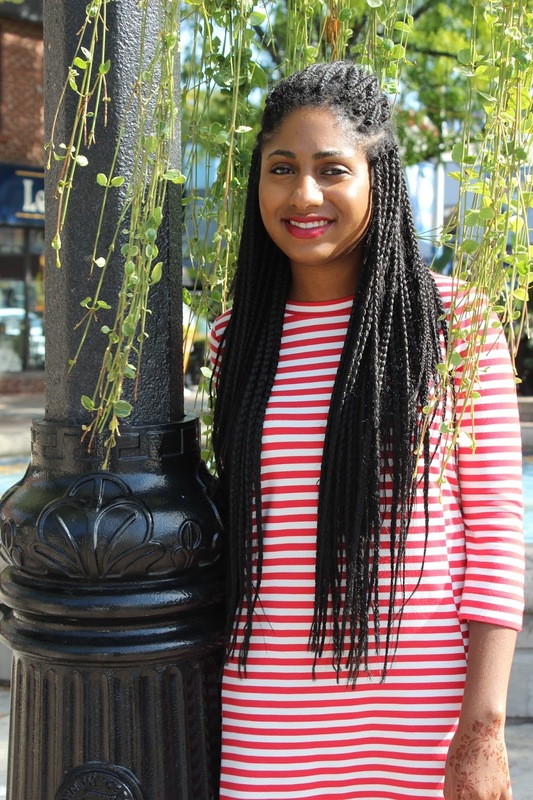 Spending my weekend in Greek town and J Crew Outfit Of The Day! This weekend I spent some time in Greek town (the Danforth) with my friend. Hence, my posing beside a metal statute of a Greek soldier. Since I was spending my day walking about, I decided to put on my favorite chic-comfort shoes- converse. I honestly have been wearing these shoes all summer, and I have no plans of stopping for the Fall. I find them to be very comfortable and they look so great on. I always feel stylish and hip when I wear them. Is hip still okay to say? Since it was such a beautiful day, I decided to wear a new dress I purchased from J Crew. 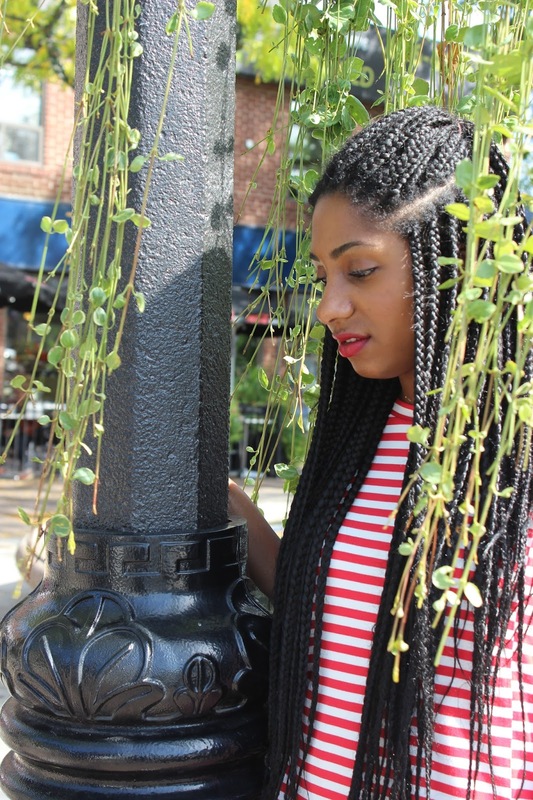 I love the red and white stripes, since it's so different from the traditional blue and white or black and white nautical pieces that I usually see in stores. I always like to wear something that is different and unique. I topped the overall outfit with a pair of blue sunglasses. Nothing says unique like a pair of blue sunglass lenses. Below are more pictures taken that day. Enjoy! I have some henna on my hands. If you can't make it out, it's flowers and roses. Thank you for reading my post! Don't forget to subscribe! Do you like wearing stripes? Also, stay connected and follow me on Instagram! Outfit of The Day: Bringing Culottes Back! It's the year of the culottes! The pants that were once popular way before most of you were born (the 60's) is in style once again. Don't you just love when the fashion styles of the past become trendy? For those of you not familiar with what culottes are, they are pants that fit wide to give the illusion of a skirt. The navy culottes I am wearing in the picture above is from Club Monaco. Since culottes can typically fall from the waist, they look great with crop tops, such as the one I paired mine with from Club Monaco or even a sweater. However, if you want to go for a bold look, one can even wear a dress over the culottes to add some dimension to the outfit. Although culottes are not for everyone, they are a great trend that is worth trying out. And for those that are petite and are concerned about looking overwhelmed, I would suggest trying different pairs of culottes on since they are not all the same height and will fit differently on. As well, make sure to add a pair of heels to help make the outfit appear more linear and elongate your body. Below are some more images of me in my culottes. Thank you for reading! I hope you enjoyed this post. Are you a fan of culottes or happy that the trend is back? 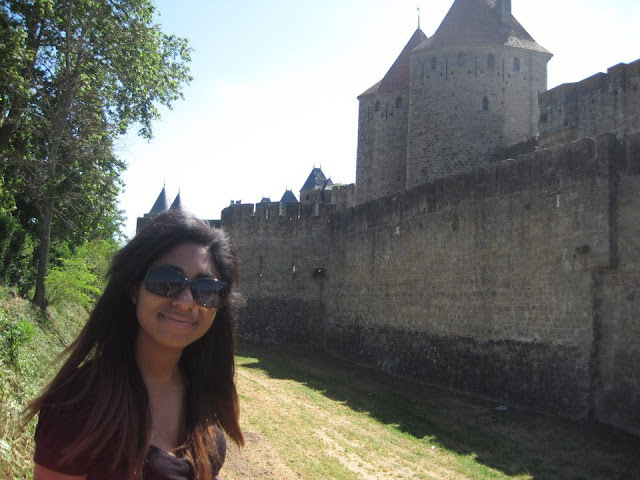 The walled city of Carcassonne was the last city I visited while in France. The city has an interesting look as it is enclosed by fortified walls that surround the town. It's quite an amazing since, as the town has walls that enclose it giving it a very medieval and historic feel. 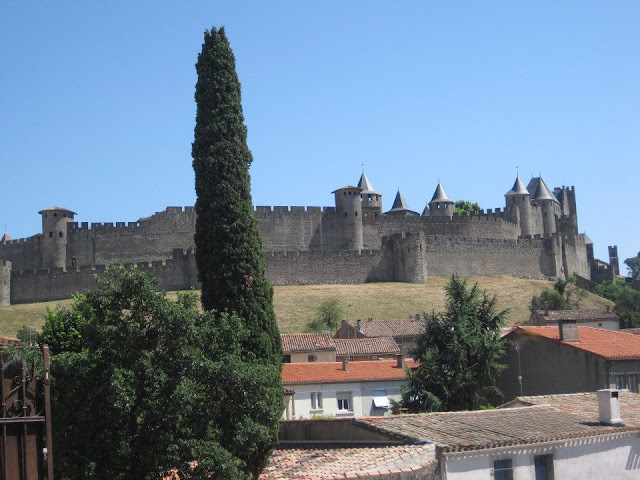 Although I did not get to explore the whole city, I did stop off at the Citadel of Carcassonne. It's one of the most popular tourist sites in Carcassonne and has bars, restaurants, shops and different activities for people to do inside. It is definitely a must if you are in Carcassonne. While it was nice to visit Carcassonne for a few hours, I must admit it was definitely one of the more quite cities in France. If you are looking for a bit of adventure you may not find it there. However, it's great for a small getaway if you want to go somewhere quite, relax and learn some history. Thank you for reading my Travel Series. I hope you enjoyed this post. Feel free to leave a comment below and Follow my blog with Bloglovin! Follow me on Instagram to see my daily adventures! Today's outfit of the day is a casual street look. 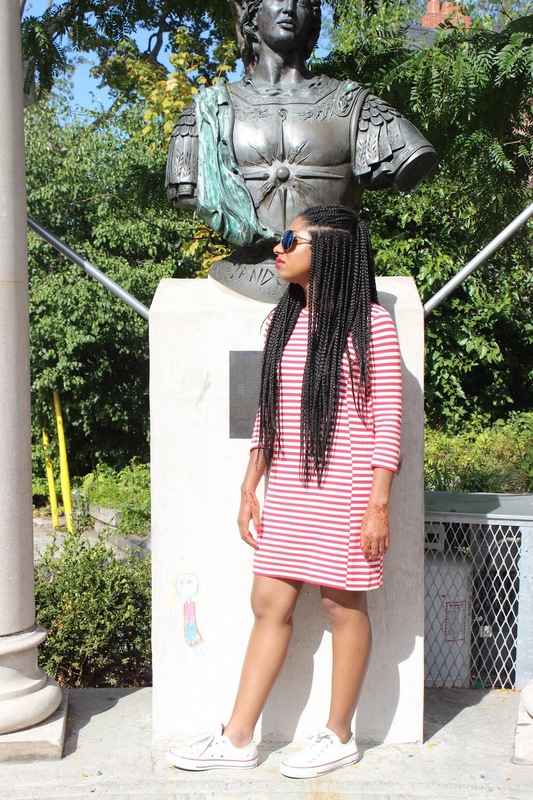 As the weather has been extremely hot in Toronto, I decided to wear a comfortable outfit that would keep me nice and cool, yet look chic at the same time. I am wearing a t-shirt from Club Monaco, a pair of shorts from Urban Outfitters and my go-to sneakers this summer- converse. I really like this outfit, since it's very simple yet looks great. In fact, whenever I am in doubt or am not sure what to wear, I throw on a t-shirt with a pair of jeans and shorts and it looks great. Below I have provided more pictures of my outfit of the day for you to check out. I hope you enjoy them! Thank you for reading! I hope you enjoyed this post. Feel free to leave a comment below. New hairstyle and outfit of the day! Today's post is multi-faceted in the sense that I have a new hairstyle and a new outfit of the day that I want to highlight. First, let me begin with the obvious change- my hair. The new hairstyle I am donning is box braids, which is a style I have wanted to do for a few months now. Now that I finally have braids, I am really happy that I took the leap to try something new. It's such a fun hairstyle that always looks great! Now that I have this new hairstyle, it only makes sense to have a fabulous outfit. In today's outfit of the day I am wearing a black scalloped crop top from Club Monaco. I will be honest, I don't usually like wearing crop tops, but I really like this crop since it's not to revealing. On the bottom half I am wearing silk pants from Club Monaco and a pair of white converse. I love to wear my converse to give my outfit a chic street look that is also very comfortable. However, if I want to make the outfit a bit more dressy, I can simply add a pair of heels or mules; which are very popular this season to change the look up. Have you ever had a drastic hairstyle?